This dish, which brings out the flavor of aperitif wine, is the most traditional appetizer in Burgundy. On our last trip there, we discovered a new use for them. Small, teaspoon little balls of these cream puffs were added to salads. Pretty good! Have not tried that yet. For a small article (and recipe) about gougères which appeared in Saveur magazine, click here. Pour the water into a thick-based saucepan; add the butter with a pinch of salt. Bring to a boil, take the pan off the heat and add the flour beating with a wooden spoon. Dry out the mixture over the heat by beating hard with the wooden spoon until it comes away from the sides of the pan. Remove from heat and add the eggs one at time beating constantly and then add the grated cheese. Drop by tablespoons unto a baking sheet . 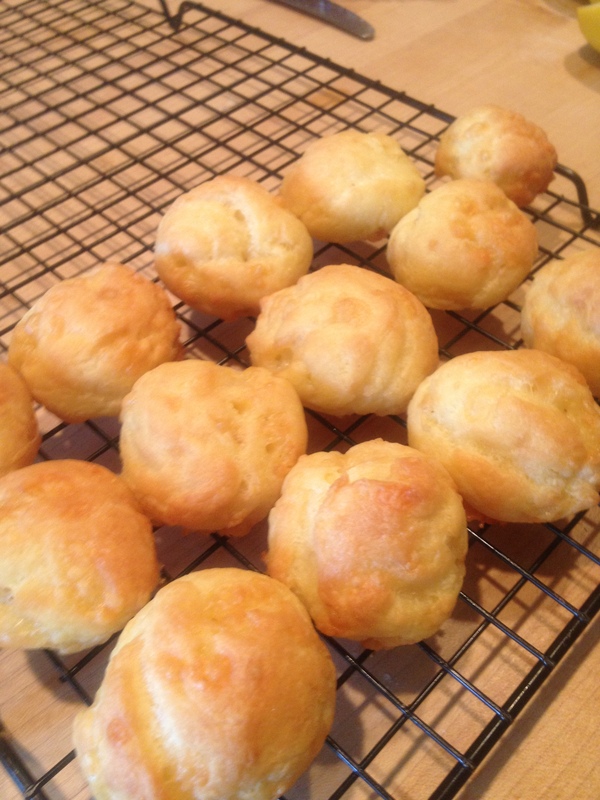 Glaze tops of the gougères with egg yolk and bake for about 20 minutes or until golden brown. Place on cooking rack and allow to cool at least 20 minutes.